View More In Table Bases. Galvanized steel plate and column, double powder coated black for protection. Can be used outdoors with minimum maintenance. Adds a contemporary look to your restaurant tables. Indoor or outdoor use. Fits up to 36-inch square/48-inch round table tops. Stainless steel columns with cast aluminum spyder and adjustable glides. Dimensions: 20-inch diameter base x 28-1/2-inch height. If you have any questions about this product by American Trading Company, contact us by completing and submitting the form below. If you are looking for a specif part number, please include it with your message. 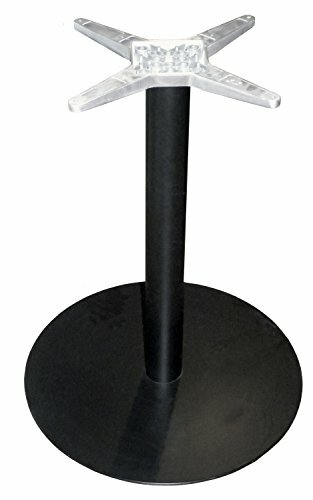 ATC Futura Round Stainless Steel Cache Plate Bolt-Down Low Profile Table Base, Bar H, 8" Base D x 39"
ATC Jennifer Polished Cast Aluminum Table Base with Two Columns, Bar H, 23-51/64" L x 33-19/64" W x 39-1/2"